Demographically, Alcoy has suffered in recent years. This is undoubtedly due to the increase in tourism which has grown exclusively along the coastline. The coastal area with its mild climate has converted the province of Alicante into one of the most important resorts in Spain and perhaps in Europe. Despite Alcoy’s proximity to the coast, (only 40 to 50 miles), the climate changes dramatically. This climatic difference is due to the mountain ranges which surround Alcoy and which rise majestically from the spectacular countryside. Although the area is beautiful it is not exactly the type of climate that the Europeans prefer. The town centre is located in a valley surrounded by the Mariola Biscoi, L'Ombrie, La Serreta, El Carrascal de la Font Roja, La Carrasqueta and Els Plans mountains. Three rivers run through the centre, joining with the River Serpis and flowing out to sea at Gandia. Despite these orographic difficulties the landscape is really beautiful with pine and oak trees covering approximately 85% of the mountainous terrain. Demographically, Alcoy’s population has dwindled to just over 60,000 considerably less than 30 years ago and immigration to the area is low compared to the coastal resorts. The language spoken is predominantlyValencian. Historically the town has always been linked to industry, firstly the textile industry then to the metal and paper industries. The importance of these three sectors was instrumental in the construction of the port in Gandia although nowadays new techniques have replaced these pioneering industries. Academically, Alcoy’s economy is strengthened by the Superior Polytechnic College which forms part of the Polytechnic Union of Valencia, and also by the College of Art and Design and the Conservatory of Music. 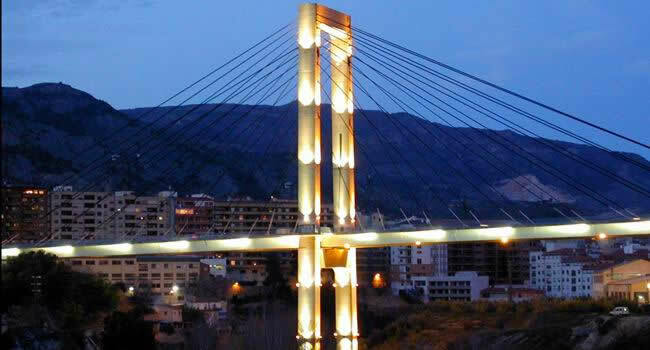 The bridges in Alcoy are another of its many attractions. A dozen of them adorn the rivers in the area. Two beautiful nature parks, the Font Roja and the Sierra de Mariola are found on the outskirts of the town, both recognized for the beauty of their landscapes. The town holds a very important “fiesta”, the origins of which date back to the 13th Century. 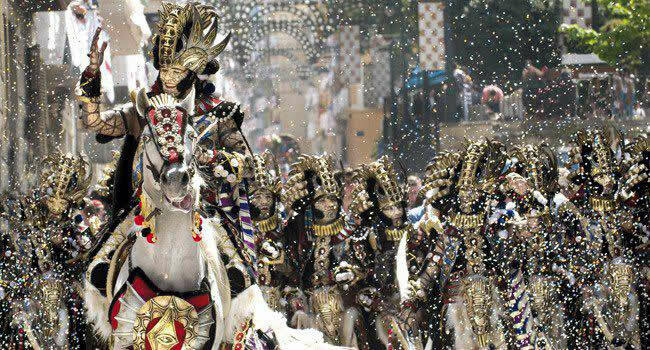 This is the famous Moors and Christians festival which is held every April . This festival was declared to be of International Tourist interest in 1980 because of its spectacular costumes and floats. The fiesta’s origins date back to 1276 and the Battle of Alcoy, when villagers clashed with the Muslim Alzraq’s troops. During the battle it is said that St George appeared on his horse at the city walls and that his appearance was decisive in winning the battle. St George is the patron saint of Alcoy. The town is also famous for the Three Kings Parade held annually on the 5th of January, which is the oldest in Spain and also for the Belen de Tirisiti, a puppet theatre which reflects popular religious themes of the 19th Century. Not to be forgotten are the famous olives stuffed with anchovies, which originated from and are commercialized from Alcoy. Other famous local dishes include Olleta, Borreta and Pericana. A coffee liqueur is the typical local beverage, drunk on its own or mixed with lemonade as well as an aniseed liqueur and a liqueur made from herbs collected from the local Sierra de Mariola. In November 2011 a new motorway connection was opened connecting Alcoy with Alicante and Valencia and which should prove beneficial to the area.